Seared scallops served with a winter salad of puy lentils finished with basil, parsley and balsamic vinegar. For the lentils: rinse the lentils under cold running water until the water runs clear. Place in a saucepan with unsalted water, a lightly crushed clove of garlic, the bay leaves and the thyme. Cook until tender. Drain and allow to cool. Peel the carrot, square off the edges and cut it into 4 long batons and then cut into small dice. Finely slice the leek. Peel and finely slice the red onion. Peel and puree the remaining two cloves of garlic. Peel and dice the tomatoes, discarding the seeds. Chop the flat parsley and the basil. In a small saucepan, reduce the balsamic vinegar to a syrup. Heat some olive oil in a frying pan. Add the carrots and the red onion to the pan and cook over a low heat until the carrots are soft. Add the garlic and cook for 1 minute. Remove from the heat and add the lentils. Season with salt and pepper and add the balsamic vinegar and a squeeze of lemon juice. Allow to cool and then stir in the tomatoes, basil and half of the parsley. Check the seasoning. For the scallops: season the scallops with a little salt. Add a little sunflower oil to a very hot frying pan and then sear the scallops for 1-2 minutes before turning, reduce the heat and cook for another 1-2 minutes on the other side. Once cooked, finish with a squeeze of lemon juice, a knob of butter and the rest of the parsley. 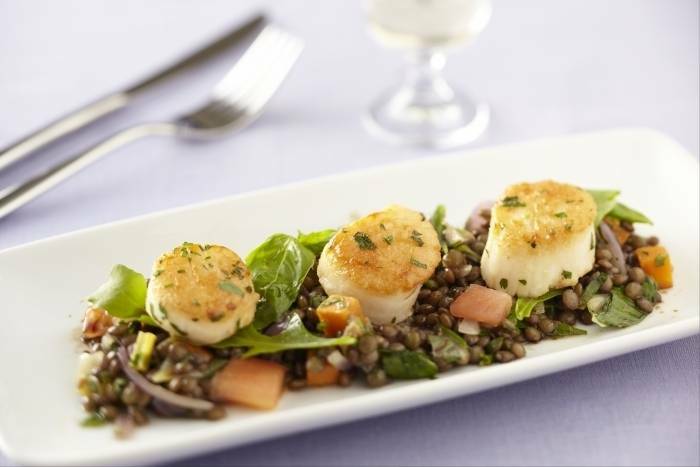 Serve the scallops on a bed of lentils and a drizzle of the cooking juices from the scallops.